I was fortunate to have Emily Peeler, JD, MSW, a staff lawyer with the Center on Children and the Law, in the audience at this presentation. She was not only helpful in answering a couple questions from the audience regarding issues not connected to ESSA, but she also provided me with a link to the Center on Children and the Law resources page for Educational Stability. This site offers numerous resources including links to the Every Student Succeeds Act Implementation Toolkit: Improving Education Outcomes for Children and Youth in Foster Care and the Fostering Connections Implementation Toolkit. 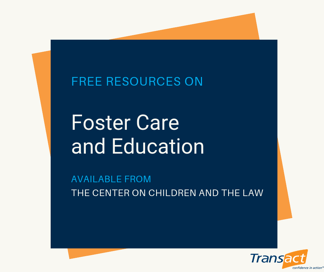 This toolkit relates to the major law addressing requirements for children and youth in foster care, or the Fostering Connections Act. The Every Student Succeeds Act Implementation Toolkit: Improving Education Outcomes for Children and Youth in Foster Care includes sections on the following topics. The presentations from the 2018 NAEHCY conference, including the presentation that I gave, are available on the NAEHCY website. You must be a NAEHCY member to access the presentations, but membership is free. You can register for access by clicking the login link on the top right corner of the NAEHCY website.